Although we have still not seen defoliation by spruce budworm in Maine, surveyors in New Brunswick have, including some right across our border. Observers on the ground mapped very light and scattered defoliation on the New Brunswick side of the St. John River between Madawaska and St. Francis. Aerial survey and additional ground plots in a wider area detected about 3,700 acres of light, scattered defoliation in the northern third of New Brunswick. The detections near the St. John River were a result of targeted roadside surveys conducted by the Province, one part of their monitoring program. Host branches from about one in four ground plots were found to have trace to light defoliation. This is not the sort of damage that would be picked up by a casual observer, nor through the level of operational monitoring conducted in Maine at current spruce budworm population level. The eastern spruce budworm, Choristoneura fumiferana, is a native moth that feeds on spruce and fir needles as a caterpillar (larva). This species has cyclical populations that build when the host trees mature. Populations reached epidemic levels in Maine, leading to tree growth loss and mortality, three times in the last century. The most recent outbreak collapsed in the late 1980’s. 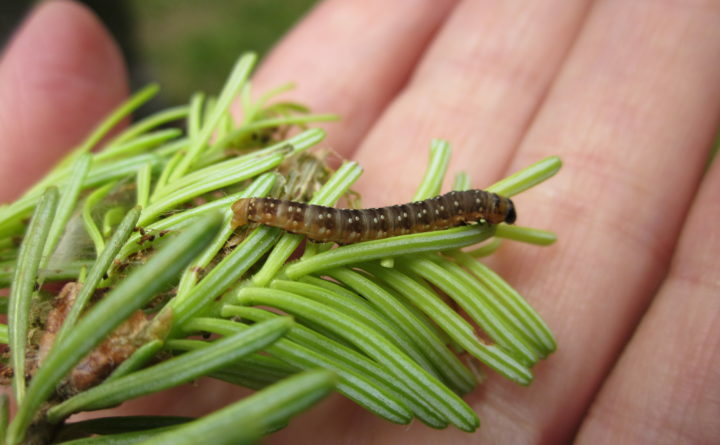 In Maine, spruce budworm feeds on the spruces (native white, red, black and introduced species) and balsam fir. Within that group of trees, the budworm has favorites. It does best on balsam fir and white spruce whose buds begin to expand early in the spring when the caterpillars are ready to feed. Red and black spruce buds swell after those of white spruce and fir, so these species are not as well suited for feeding by young spruce budworm caterpillars. Maine has about 5.8 million acres of spruce and fir-dominated forests which is an area equal to the size of New Hampshire. Defoliation has intensified on the Quebec side of the Maine border as well, with increases in area and intensity seen in the Bas-Saint-Laurent Region, which lies closest to our northwestern border. The Province of Quebec has been mapping defoliation from this pest for more than a decade during the current outbreak. In 2017, more than 17.6 million acres of forest were defoliated across the entire province representing an area nearly equal to all of Maine’s forests. Pheromone trapping of adult moths is another method for monitoring populations of spruce budworm. The Maine Forest Service (MFS) has led a cooperative pheromone trapping effort which is just wrapping up for the year. As in the past several years, around 20 private and public organizations participated in the program. Several of these cooperators have already retrieved their traps and sent in samples to the MFS Insect and Disease office in Old Town. Others will be collecting their samples next month at the same time as another sampling effort involving the collection of overwintering spruce budworm larvae (L2 Survey) is completed. In addition, citizen scientist volunteers with the Healthy Forest Partnership led Budworm Tracker Program (budwormtracker.ca) have collected their traps for the year and are sending in their catches for analysis. Together, the data from these surveys will provide a reasonable picture of current spruce budworm populations in Maine. To date, about 27 percent of the MFS-Cooperator pheromone trapping locations have been received and counted with catches on par with last year which was down significantly from the previous summer (2015). Across 114 sites, the average catch is nine moths/trap; the average on the same sites in 2016 was six. Catches range from zero to 68.3 moths/trap and the highest numbers are found in a 40-mile wide band south of the northern boundary of our state. Sites in the eastern third are also tending towards higher catches than those in the western two thirds. This trend is apparent from Route 9, north to the border with New Brunswick. The sampling is not complete for this survey and we anticipate receiving moths from more than 300 additional locations. In addition, ground surveys in Maine this fall will be targeting areas closest to the known defoliation in New Brunswick and Quebec. The picture could change before the dust (composed of moth scales in this case) has settled from those surveys. The coming epidemic of spruce budworm in Maine’s forests will probably be less severe than that in the 1970’s-1980’s. However, a significant loss of trees and wide-ranging impacts to Maine’s natural-resource based-economy, forest structure and composition, wildlife and our society are expected. Forest and social conditions in Maine have changed greatly since the last outbreak, so it is difficult to predict the specifics of what the next will bring. The best time to prepare for a spruce budworm outbreak is between them, and the current low populations and lack of detected defoliation observed in Maine gives forestland owners and managers, as well as others who will be impacted, additional time to prepare. For more information visit sprucebudwormmaine.org.